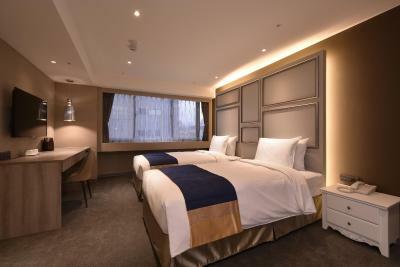 Lock in a great price for Green World ZhongXiao – rated 8.8 by recent guests! Room is so clean and spacious, excellent housekeeping, bathroom is new and immaculate. Will stay here again! The location was fantastic. The bed and pillows were really comfy. I had a wonderful night of rest. Excellent location right outside Zhongxiao Dunhua MRT station. Rooms are very large, surprising given its location. Rooms are quiet especially considering the hotel is on the main road. The bathrooms are very nice and spacious with separate shower and bath tub. Breakfast is mediocre. It it's not included in your room rate, I'd suggest skipping breakfast as there are plenty of options nearby. The breakfast quality and selection far exceeded our expectations for this hotel. The breakfast staff and check-in staff were friendly and helpful. We had a windowless room, but it was spacious and the restroom was luxurious and huge! Everything was clean and comfortable. Wonderful location: close to the ZhongXiao MRT and lots of shops, cafes nearby. The bed is so comfy and large. I enjoyed the bathroom which is large and so functional!! I loved the design of the hotel, the smell in the lobby downstairs (I know that sounds weird, but the air freshener smelled like a man’s cologne), the bathroom was amazing - overall it was great! Convenient location, spacious room. comfortable bed, menu changed at breakfast buffet. I like how the ref has always been filled up with water and soda and the modern look of the bathroom and that the room that we booked is really spacious for 2. Everything was great, room was very comfortable, good size, very convenient location for metro (2 min. walk), lots of interesting restaurants & shops nearby, great staff. Will definitely stay again. Green World ZhongXiao This rating is a reflection of how the property compares to the industry standard when it comes to price, facilities and services available. It's based on a self-evaluation by the property. Use this rating to help choose your stay! One of our top picks in Taipei.Close to MRT Zhongxiao Dunhua Station (Exit 3), Green World ZhongXiao offers accommodations in Taipei. Free WiFi access and free private parking are available on site. Green World ZhongXiao is only 1 metro stop away from Sun Yat-sen Historical Museum of History, while Taipei Main Station and Taipei Songshan Airport are 4 metro stops away. Guests can reach both Tonghua Street Night Market and Taipei 101 in 10 minutes' car journey. Featuring air conditioning, each guest room has a flat-screen cable TV, wardrobe, working desk, sofa, electric kettle and refrigerator. 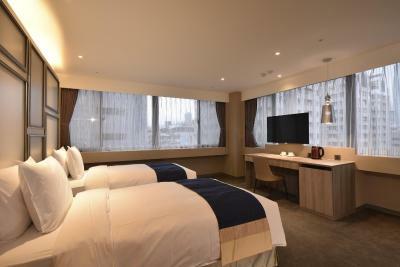 Guests will have city views through the window in certain room types. The private bathroom comes with shower and bath facilities, free toiletries and a hairdryer. Green World ZhongXiao has a 24-hour front desk where guests can get local touring information, make currency exchange and free use of the luggage storage. Other services include dry cleaning, ironing service and laundry service are also available. The in-house restaurant serves buffet breakfast daily. 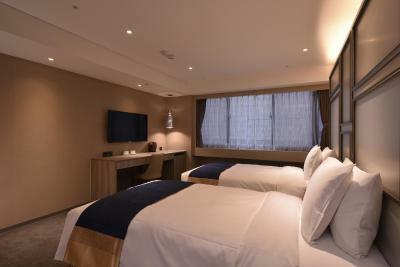 When would you like to stay at Green World ZhongXiao? This family room has a electric kettle, soundproofing and hot tub. 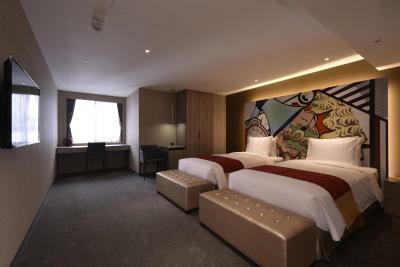 This twin room features air conditioning, sofa and flat-screen TV. This twin room features a cable TV, soundproofing and electric kettle. House Rules Green World ZhongXiao takes special requests – add in the next step! Green World ZhongXiao accepts these cards and reserves the right to temporarily hold an amount prior to arrival. Guests are required to provide a valid credit card which to guarantee the booking. The property will pre-authorize the first night fee to guests' credit card. The property will cancel the pre-authorization upon check-out. Breakfasts were incredible, good range of options, including vegetarian dishes. The only plus point of the hotel is the location. Very good location! Super friendly staffs! Our room did not have a window. Name of hotel can’t find in google map. Have to link location from booking website and open in google map. The only thing which we were not fond of was the thin wall. Bed and pillows were a bit hard for my liking but it's still fine. Other than these two, everything was perfect! Location was superb, literally next to the zhongxiao dunhua mrt station exit. Check in was easy, staffs were helpful and breakfast was nice. Room was beyond expectations, lighting was nice and cozy. I really love the tv and bath-up too! Would love to stay hear again next on my visit to Taipei. Room was big.. breakfast was good.. price is reasonable! Very poor sound proofing in the room. I could hear the voices and noises coming from the neighbouring room especially the turning on and off of the taps. walls were too thin. could hear people walking along corridor and staff communicating with each other via walkie talkie. this woke me up in the morning. did not get good sleep. Bigger lobby, check in desk/ sitting area too small. clean room & comfortable bed. Close to MRT.